Easter is just around the corner and I'm sure most of us are excited for Peter Rabbit's visit toting his basket of sweet treats and chocolate goodies come Easter Sunday! I don't blame you. Who can't resist chocolates?! Not I. Though this year, there's a bit of a change on our Easter basket. I'm sure Peter Rabbit won't mind. He better not! After trying Edible Arrangements® Easter Bunny Celebration™ with Dipped Pineapple, I now would like fruits with my chocolates! After trying Edible Arrangements® Best Dipped Fruit, I was given another fruity treat to try out. Edible Arrangements® Easter Bunny Celebration™ with Dipped Pineapple fruit bouquet. The bouquet look so pretty I almost didn't want to "destroy" its pristine arrangement. But the sumptuous fruits were irresistible. They were destined to grace my mouth! 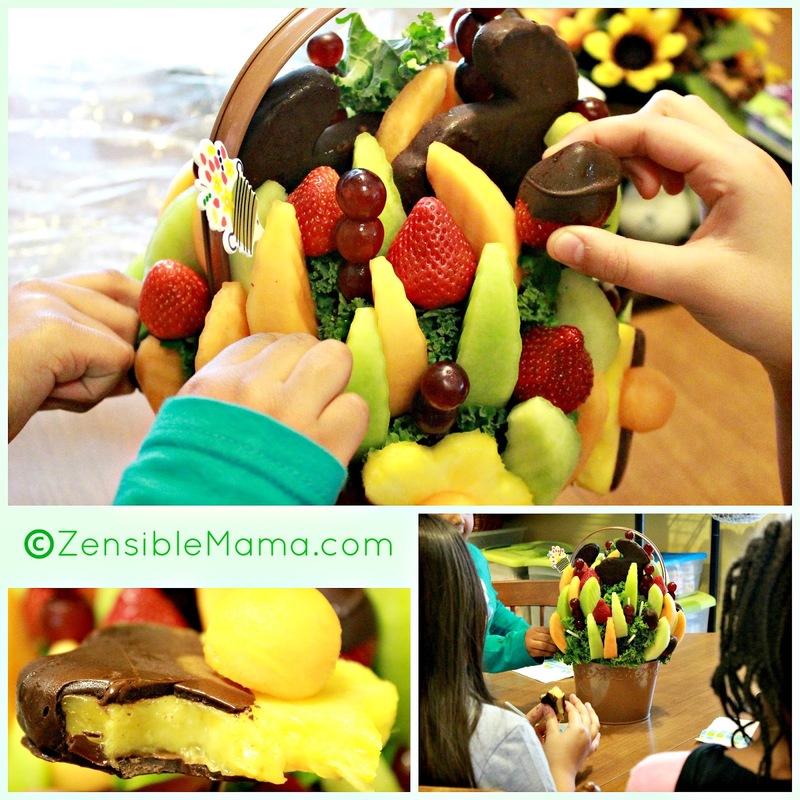 The fruit bouquet consists of gourmet semisweet chocolate dipped pineapple bunnies, fresh strawberries, cantaloupe, honeydew, grapes, and semisweet chocolate dipped pineapple daisies. I shouldn't tell you that the fruit bouquet didn't last all day. I had three little fruit monsters devour the "basket" of fruity goodness. It made for a great snack for my daughter and her two friends who came by to play with her. It was also an opportunity for me to reinforce healthy snacking to these young children. And they loved it! Win! I'm truly impressed with the total packaging and branding Edible Arrangements apply to each of their products. The fruit bouquet is wrapped in customized plastic wrapper bearing their name, including the ribbon that they used to tie the wrapper up. Then there's the keepsake tin basket that went with the arrangement. I'm so keeping it of course. If you must know, it now sits in my living room as part of my new added home decor accent. Another win! Edible Arrangements® fruit bouquets can easily be a great option to a healthier alternative to every occasion. Be it Easter or not. It can also be a great way to introduce healthy snacking to young children during birthday parties. One that I'm personally planning on doing for my daughter's upcoming Spring birthday this April. She already have a favorite bouquet in the collection! Oh my! We'll see. 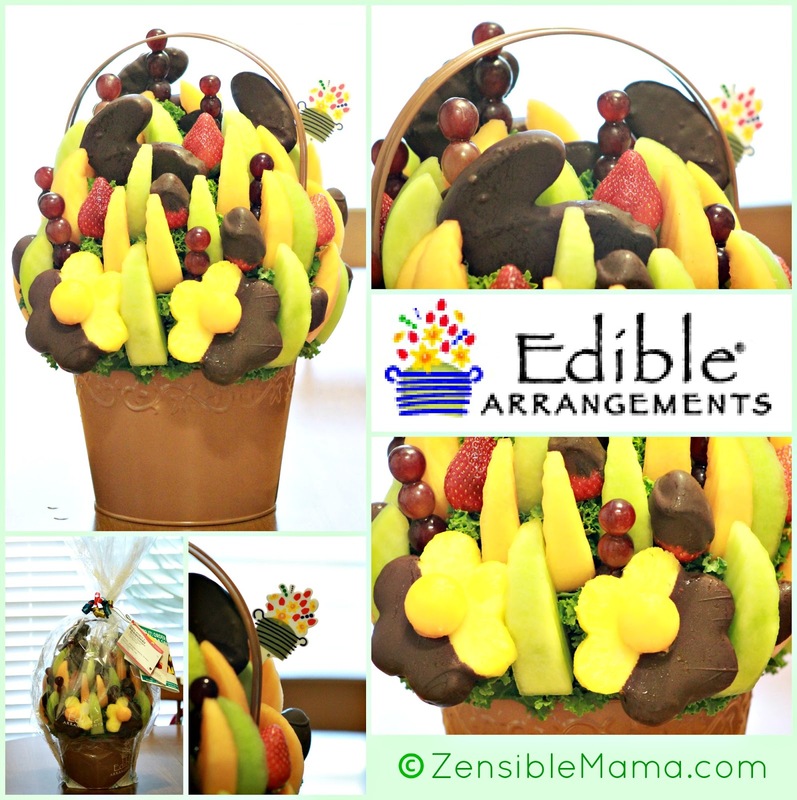 Enjoy a $5 savings on any arrangement or dipped fruit box with this coupon code: DFBP0413. Easter is March 31. And if you're thinking of a healthy gift for your mom this Mother's day or for yourself, Mother's day inspired fruit bouquets are available starting April 2nd. + Edible Arrangements® provided and delivered the complimentary product to facilitate this review. All opinions are ours.